don't let lack of bread keep you from enjoying french toast. i used my 5 minute donut recipe and comined my love for both donuts and french toast to make snickerdoodle french toast donuts! Easy to make and delicious to boot! Combine ingredients (except last 2) to make donuts in a medium sized bowl. mix well with hands until a dough forms. pinch off pieces of the dough and form into a donut shape. repeat with rest of dough then microwave for ~2-3 minutes. Dunk donuts in eggs then cook up in a skillet like french toast. 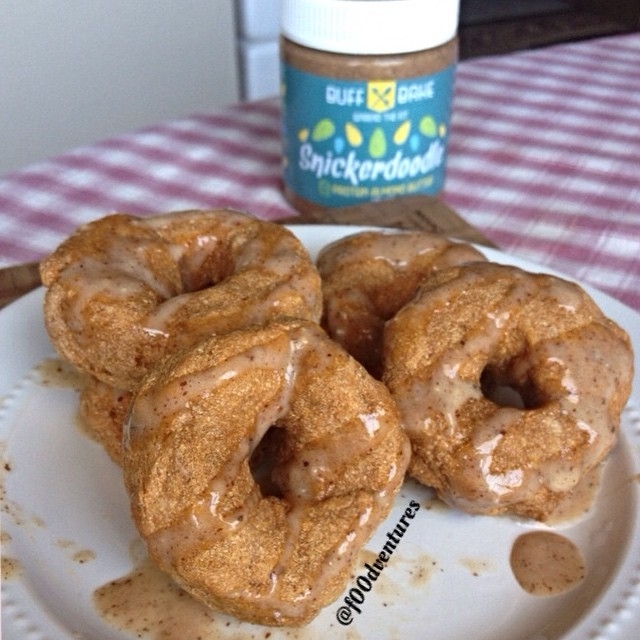 drizzle with buff bake snickerdoodle almond butter and enjoy.